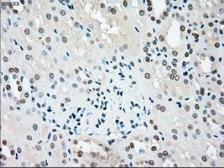 Specificity/Sensitivity : The antibody preferentially recognizes the p17 fragment of the active Caspase 3 . Specificity/Sensitivity : The antibody detects both pro Caspase-3 (~32 kDa) and the large subunit of the active/cleaved form (~14-21 kDa) of Caspase-3. 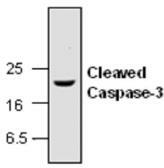 The large subunit of the cleaved form may appear as one or two or even as a stack of bands depending on the presence or absence of the Caspase-3 pro-domain. 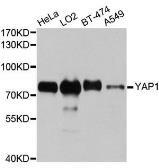 It is highly recommended that a maximum sensitivity ECL substrate (Femto sensitive) be used for efficient detection of this antibody in Western blot applications.